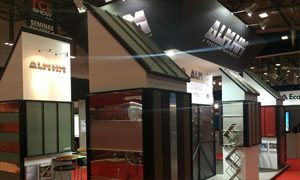 ALM Hard Metals are the UK’s largest stockist of VMZINC, Rheinzink and Nedzink Sheet and Coil for roofing, Façade cladding and matching metal rainwater systems. VMZINC offer 7 different colour pre weathered finishes for sheet and coil. VMZINC Natural (bright), QUARTZ, ANTHRA are all natural finishes whilst VMZINCs PIGMENTO Range includes PIGMENTO RED, GREEN, BLUE and BROWN. Nedzink offers 3 variations of colour finish but also offers the Structure Range which gives the zinc surface a textured finish. Further to the colour finish and structured rolling, Nedzink also offer Pro Tec underside coating which allows zinc to be installed in non vented / warm roof construction. All material warranties can be obtained from ALM HM immediately after completion of any project carried out to Nedzink Specification. Nedzink Structurel products are also available through ALM HM. Rheinzink offer 3 pre weathered colour finishes, known as the Pre Patina Range. This includes Bright Rolled (Natural), Blue Grey and Graphite Grey. These finishes are available with Rheinzinks Pro Roofer underside coating which allows installation of the zinc material onto plywood, rigid insulation and composite panels. Rheinzink also offer a Pre Patina Blue Grey and Graphite Grey with a protective external coating for coastal and other harsh environments. Furthermore Rheinzink Colour Line range which consists of 5 lacquered finishes over high quality Rheinzink material. The colours are, Pearl Gold, Blue, Tile Red, Moss Green and Nut Brown. Interieur Line is another offer from Rheinzink specifically for interiors and is available in Blue Grey and Graphite Grey. PIGMENTO is achieved by rolling transparent colour pigments into the zinc surface which are then bonded using an organic coating. VMZINC also offer a similar coating on QUARTZ and ANTHRA for coastal projects or areas where air pollution or high salt content may affect external building materials. This product is known as VMZINC Strat. All of the above finishes are available with VMZINCs PLUS Coating. VMZINC PLUS is and underside protective coating which allows zinc to be installed on substrates that historically were not possible. Total warm roofing using zinc is possible thanks to VMZINC PLUS. Further to the sheet and coil, matching Rainwater systems such as PLULINE D and RWS P in Natural, QUARTZ & ANTHRA are also stock items at ALM HM. VMZINC also offer Bi Lacquered (factory painted zinc) in Copper Green, Macao Brown, Dark Brown, Sky Blue, Off White and Slate Grey for sale through ALM HM. Zinc as a roofing or cladding material is long-lasting, malleable, flexible and aesthetically pleasing and furthermore suitable for all roof pitches over 3/5 degrees. As well as straight forward up and over roofing, Zinc can be formed to take curved and angular design offering great freedom of expression. The traditional standing seam system allows long strips of zinc to be assembled by forming a single or double folded seam on the upstands. Double fold is always used for roofing, single or double fold can be used for cladding. The zinc arrives on site in coil or sheet form. It is then run though a profiling machine, also available from ALM HM. Once profiled the metal is laid on continuous decking and anchored using stainless steel fixed and sliding clips (or Warmfast Clips) allowing the metal to move freely and independently of the substrate. This method is ideally suited to large roofing areas, and this style of roofing readily adapts to almost any design. It is well suited to areas with harsh climates, as it provides maximum water and wind resistance and is reasonably easy and very cost effective to install. In order to optimize metal consumption and minimize waste, further lowering the overall cost, it is highly recommended to carefully consider seam layout so that skylights and other penetration are accounted for. Rolled cap is a traditional longitudinal assembly technique involving timber battens and capping strips. The zinc sheets and long zinc strips are held in place by a zinc batten clip supporting the peripheral upstands. From a design standpoint, it provides expression of strong contours, shadow effects and urban character. From a construction standpoint, installation is straightforward, with the ability for easy dismantling for any repair or changes required, or for end of life deconstruction. This style is suitable for nearly all types of building. It is critical when installing zinc metal roofing that it coordinates with other building components ensuring no contact or run off issues. It is essential to use trained and experienced installers, with architects and designers taking care to understand the metal using the appropriate substrate and vapour barrier, insulation and framing support systems for the desired design. Warmfast Vapour Barrier is most recommended when specifying a metal roof as this offers a cost effect “temporary” water tight shield and being self adhesive, foil faced with a bitumen centre, it has very high vapour resistance and also self-seals around any through fixings. When placed in contact with zinc, some products can have detrimental effects on the appearance and/or structural integrity of the zinc. There are no known issues with zinc in combination with metals other than copper and mild steel. Contact between zinc and copper in the presence of an electrolyte (such as water) creates an electrolytic reaction which will lead to corrosion of the zinc and subsequent failure of the roof or wall. Therefore, run off from a copper surface to a zinc surface must be avoided under all circumstances. It is undesirable for Zinc to come in contact with mild steel also, due to similar electron transfers between the metal resulting in zinc surface corrosion which can occur on the external or internal surface depending on where contact takes place. If externally warning signs such as discolouration will appear. If internal it may not become apparent until perforation through the external skin appears. As a general rule, water should not be allowed to run from a higher potential metal onto a less noble metal. Acceptable contact products for zinc include lead which has had patination oil applied to prevent milky run off (run off doesn’t affect the zinc but can leave a stain), aluminum (painted, anodized), galvanized steel, stainless steel and compatible woods including pine, spruce, scotch pine, and poplar. Cured hard woods can also be used – see thermowood online. Unacceptable contact products and run off for zinc include but are not limited to; uncured timbers with a PH of minus 5, brick acid cleaners / any acidic products, copper, Steel (sawn metal swarf), Bitumen, wet lime, lime and gypsum dust. Please always refer to the manufacturers manuals for more info. Throughout its life zinc requires no cleaning, in fact, the self forming patina is best left alone as this constantly regenerates ensuring that the roof stays clean and uniform in colour. If colour differences are experienced, this will be down to an external or internal issue that needs to be defined and resolved.